Do organisms use fluorescence to help them through their daily lives? This is a question that is often asked when fluorescence is observed in nature. These observations are often accompanied by speculation and suggestion, but without the work needed to make a strong scientific case. We wrote about this in an article on this web site. A recent paper in Current Biology by Hendry et al. (full citation below) is a welcome exception. The authors demonstrate that pea aphids (Acyrthosiphon pisum) avoid feeding on leaves when virulent P. syringae bacteria are present. This avoidance behavior depends on visual detection of fluorescence from the bacterial compound pyoverdine in the presence of ultraviolet light. It is this last factor, a good documentation of the behavioral response, that is so often missing. Hendry, T. A., Ligon, R. A., Besler, K. R., Fay, R. L., & Smee, M. R. (2018). Visual Detection and Avoidance of Pathogenic Bacteria by Aphids. Current Biology, 28(19), 3158-3164. 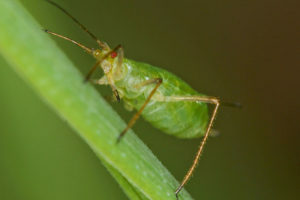 Pea aphid image by Andy Murray, licensed under the Creative Commons Attribution-Share Alike 2.0 Generic license. No changes were made to the image.